This course will introduce you to English vocabulary related to food and drink. You will study English singular and plural nouns, the difference between English countable and uncountable nouns, and learn how to form sentences related to food in English. The course will also teach you how to form positive and negative questions, answer using the verb 'to be', form plural nouns by adding 's' or 'es', and use English articles and measurement nouns. 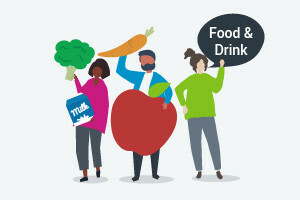 In this free online English course you will first study countable and uncountable nouns in singular and plural forms that are focused on food and drink. You will then learn when and why we use articles and collocations with English nouns. The course will also teach you how to form simple question and answer sentences using singular and plural nouns as well as how to use measurement nouns in phrases with food nouns using the suffixes 's' and 'es'. Next, you will then learn when to use the English adjectives 'some' and 'any' in sentences with food nouns. The course will then teach you how to use numbers relating to quantity as well as how and when to use quantifiers in English sentences about food. You will also study new English vocabulary and grammar related to ordering food and drinks. Finally, you will learn why we use modal verbs and contractions when making requests in English. Learning how to order food and drinks is a skill that every English student needs to acquire. This course will make sure you have a strong understanding of countable and uncountable nouns, adjectives, quantifiers, and modal verbs that you will find useful when asking for things or making food requests in English. What's more, you will even learn some cooking tips while studying the lessons! So, try out this free online elementary level English course now, and boost your English language skills in no time. List countable and uncountable food nouns in singular and plural forms. Explain when and why we use articles and collocations with nouns. Be able to form simple question and answer sentences using singular and plural nouns. Demonstrate how we use measurement nouns in phrases with food nouns using the suffixes 's' and 'es'. Justify when we use the adjectives 'some' and 'any' in sentences with food nouns. Illustrate how we write and say numerical forms relating to quantity. Show how and when we use quantifiers in sentences about food. Review vocabulary and grammar relating to ordering food and drink. Prove why we use modal verbs and contractions when making requests.